Our dynamic and out of the box thinking makes us creative and helps us come up with wacky ideas that make people jump up and take notice of what we have to offer. We understand that one must adapt quickly in an ever changing market place. Our ability to improvise in challenging situations helps us stay ahead of the curve. Our association with renowned international travel trade exhibitions gives us an in depth insight into the emerging trends in the world travel market. This association helps us maintain a good rapport with the different segments involved in the travel trade such as, MICE, luxury, adventure travel, inbound and outbound tour operators, hotels and also with service providers throughout the region. Our service is personalised and we work closely with our clients to ensure that we understand their needs and requirements. We use our clients’ vision to create a synergised, tailor-made sales and marketing plan to find the perfect solution for all their marketing needs. We understand that the media plays a pivotal role in creating awareness among the populous. Hence, we have over the years developed a healthy working relationship with the top media and publishing houses in the country. These relations with the leading journalists of the country help us spread the word about our global partners in the country. The most important belief that drives our work force is that there is no substitute for hard work. It is this very philosophy that makes us one of the best representation companies in the country. 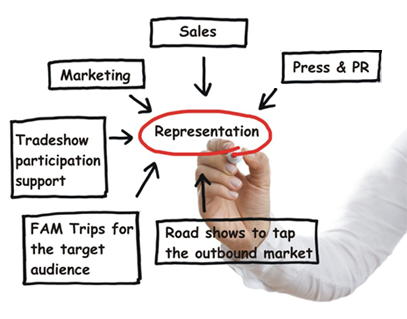 We make sure that the maximum sales opportunities are offered to DMCs, hotels, resorts, attractions, etc. We work in close conjuncture with our partners to ensure that their product is perfectly positioned to realise its true potential in the Indian market. We created awareness, open doors, manage partnerships and much more in order to increase sales. We specialise in aggressive marketing and campaigning to the Indian corporate sector, event management companies, outbound tour operators as well as to the masses. Thus making sure that our clients and their products not only get heard and seen but also acknowledged by the Indian market.